Biden: Cuccinelli is "the antithesis of change"
Vice President Joe Biden joined Terry McAuliffe, the Democratic candidate for Virginia governor, Monday to warn voters that the politicians on the Republican ticket are "the absolute antithesis of change and progress." 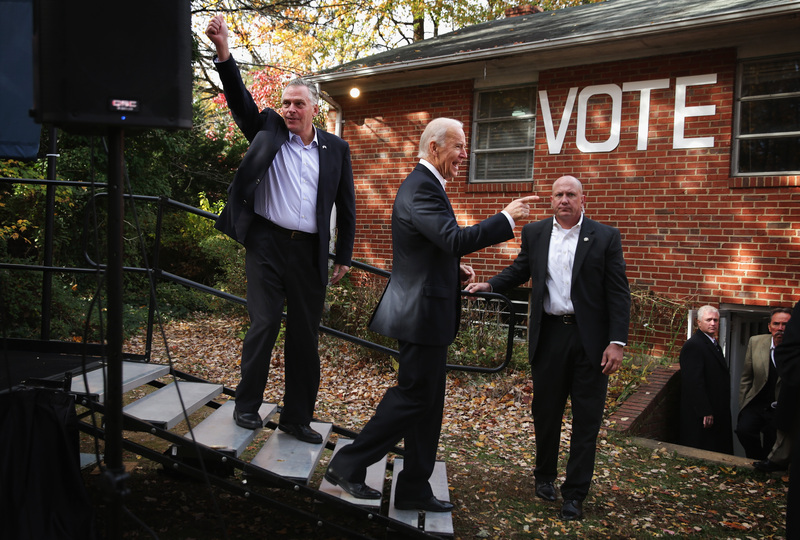 Biden was part of an all-star final push for McAuliffe in the final days of the campaign ahead of Tuesday's election. On Sunday, President Obama made an appearance with McAuliffe in the Virginia suburbs of Washington, D.C., where he tied Virginia Attorney General Ken Cuccinelli, the Republican candidate, to the politics that led to the unpopular government shutdown. Bill and Hillary Clinton, longtime McAuliffe friends from his days as a Democratic fundraising powerhouse, havealso campaigned in Virginia. Biden echoed the many Democrats who have said Cuccinelli is too extreme to represent Virginia, an increasingly purple state. "Everything [the Republicans] talk about, without exaggeration, is about turning back what the rest of the country and the world thinks is progress," Biden said. "The whole nation is looking at this race, and folks, it comes down to you." Like Obama, he drew a link between Cuccinelli and the shutdown by suggesting that Cuccinelli wanted to govern in "the new tradition of Ted Cruz," a reference to the Texas senator who helped spark the shutdown strategy. Biden said McAuliffe, in comparison, is "no ideologue, he's a practical guy," and pointed to his middle-class upbringing in the state. He told Virginia voters - who are accustomed to being one of only two states to choose their leaders in the year after a presidential election - to make sure to match the turnout he is expecting from tea party supporters. "They do turn out those who share those views out of the 30s and 40s and 50s," Biden said. "Don't take this for granted." The Cuccinelli campaign pushed back against Biden's comparison of McAuliffe to former President Abraham Lincoln by challenging the Democrat's credibility, a familiar trope in the campaign. "Vice President Joe Biden's visit and rhetoric today in favor of Terry McAuliffe encapsulates a campaign for governor on the part of Democrats littered with absurdities and falsehoods," said Cuccinelli spokeswoman Anna Nix. "Biden is the poster boy for the failures of this administration and its lies concerning ObamaCare. He also has the distinction of having helped secure a White House meeting for McAuliffe and executives of his failed car company. Tomorrow, voters in Virginia are going to reject the unserious and dishonest campaign McAuliffe and his surrogates have engaged in, and support Ken Cuccinelli's vision for stopping ObamaCare and moving Virginia's economy forward with a competent and responsible economic plan." The race has been close but McAuliffe has head onto a steady lead in recent days. A new Quinnipiac poll out Monday showed him with a 46 to 40 percent lead over Cuccinelli, a smaller margin than a survey from Oct. 23 in which he was up 46 to 39 percent but up from an Oct. 30 poll that had him up only by 4. Cuccinelli is set to campaign later Monday with Florida Sen. Marco Rubio, R-Fla., and with former Rep. Ron Paul, R-Texas, in an evening rally. The appearance with Paul, a libertarian who ran in the 2008 and 2012 presidential elections, could help sway supporters of Virginia's Libertarian Party candidate, Robert Sarvis, who has 8 percent in the latest Quinnipiac survey.